Located at 905 Buckwalter Parkway in Bluffton -- 3.5 miles south of Highway 278 and 0.7 miles south of Bluffton Parkway and Hampton Hall. From Highway 278, take Buckwalter Parkway 3.5 miles. 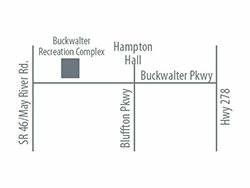 Make right into main complex entrance marked "Beaufort County Buckwalter Regional Park".